Ideal for active individuals or athletes recovering from Grade I or II ankle sprains and those who are looking to prevent ankle sprains. The Airsport is extremely fast and easy to put on. Utilizes Aircast's Aircell Technology to prevent and heal ankle sprains for people on the go! Designed for the chronic sufferer of ankle sprains, the Airsport ankle brace incorporates features of the clinically-proven Air-Stirrup ankle brace like the semi-rigid shells and aircells to provide comfort and support. Additional compression and stabilization is provided by an ATF (anterior talofibular) cross strap and integral forefoot and shin wraps. This is one of the easiest ankle braces to apply. The unique "step-in" design makes the Airsport extremely fast and easy to put on. All you need to do is Step in, Strap Up, and Go! This combination of compression and stabilization, coupled with the easy application makes the Airsport ankle brace ideal for active individuals or athletes recovering from Grade I or II ankle sprains or those who are looking to prevent ankle sprains. You'll get support and protection from inversion and eversion. Provides you with additional compression and stabilization. Another source of compression and stabilization. Shop our complete selection of ankle braces or browse additional Aircast. Hi I recently suffered a Grade II ankle sprain tearing a ligament and a fibula fracture, no surgery needed. Im recovering nicelly but had chronic ankle inestability on both ankles but love doing canoeing, kneeling on the floor of the canoe to paddle. I would like to know which one of your braces would be better to wear when I will recover and go canoeing again?, because it will need to fit inside a sport shoe, get wet and allow me to stay kneeling down over my feet. Would you suggest 2 different styles, one for the ankle that had the recent lesion and another type for the one just with chronic inestability? Thank you for your question. The AirCast Airsport Ankle Brace would be appropriate for your injury. The DonJoy stabilizing Ankle may be a better option as it is a little more streamline. I am a trail runner and run obstacle course races. Which brace would you recommend for courses that involve running on uneven ground and also through mud/water? The Aircast A60 or the Aircast Airsport? Please advise. Thank you! what shoes are best for wearing with an air cast? Thank you for your question. Athletic shoes would be a good option. Hello, I chronically sprain my left ankle while running (roll to the left) . Minor sprains until the last one 5 months ago which was grade II. Which is the best brace to prevent rolling/re-injury that I can comfortable run in? A60 doesn't look like enough though looks comfortable. Are the sides of the Airsport rigid? Thank you. 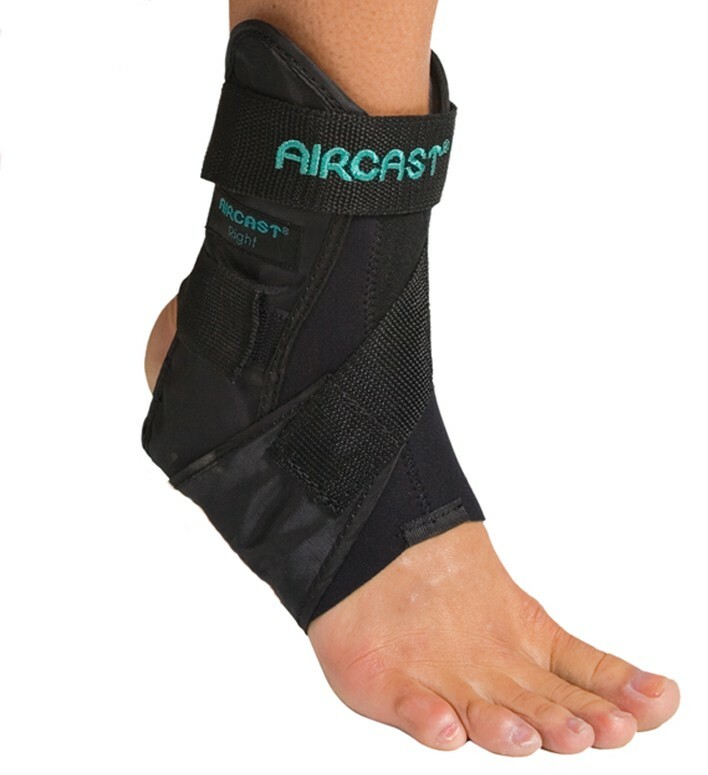 The Aircast Airsport is a great brace to provide support for multiple ankle sprains. There are two plastic stays on the brace one on each side of the ankle with padding on the inside of the brace for comfort. Ther brace slides on your foot then there is one small strap in the back to hold it on and one longe strap that wraps around the ankle for added support. The brace is bigger than the A60 but should still fit in to an athletic shoe. Hi. I have severe chronic ankle instability, have since childhood (i was a professional klutz), i am a Firefighter/EMT, very active, always on my feet. My jobs and hobbies require allot of standing, walking, high impact, kneeling, and running all with heavy weights. I am looking for the most ideal brace i can find, do you have any input? I would greatly appreciate it. Stability and mobility is ideal, but i understand that i cannot always have both, so stability would be priority. Thank you for your time. Thank you for your question. The Aircast Air Sport will offer a good amount of stability. The Velocity is going to provide the maximum support and is also very comfortable, which is also an option. Can I wear my aircast for games or should I buy one specifically meant for athletic use? I currentky have both a left and a right version of the A60 but find the plastic support sometimes digs into my ankle and causes discomfort. I am currently looking at the Aircast Airsport with the hope that it will provide all the benefit of the A60 with more comfort. Is this a good assumption? Can you speak to the major differences between the two braces? My intention for the brace is to wear for prevention as I have rolled my ankles many times in the past and they are now pretty weak. I have flat feet, especially the right one where the arch is collapsed. I play soccer every week, and recently sprain my right ankle twice. It seems that my ankle gets weaker and weaker. I am looking for a brace that I can wear together with the orthotics, to recover and prevent any more sprain ankle while playing soccer. This brace will fit fine with your orthotics. The bottom of the brace where your arch would be is nylon material and should not interfere with the fit of your orthotic. Another option to look at would be our DonJoy Stabilizing Speed PRO Ankle Brace. The Speed Pro is semi-rigid as well and will also a feature lace-up design with figure 8 strapping (similar to tape). Thank you for your question and feel free to contacting us with any more questions you may have. Will a work boot fit over this brace? I work on the railroad and sprain my ankles often. Hi I am recovering from an ankle fracture and surgery, in my sixth week. I'm out of a hard cast and in an aircast xp walker. I am at the point in my recovery when I can start to bear weight on my leg and I believe I no longer have to wear the aircast at night. Although eager to shed the bulky aircast for sleeping I find it uncomfortable not to wear it. What I'm looking for is a brace that is smaller and more comfortable to wear in bed and perhaps i could use later in my recovery for walking etc.. Please take a look at the following ankle braces, these may be great options for you. I am having a hard time deciding on what size I should order. I am a ladies size 8.5. Which size Aircast Airsport Ankle Brace should I order? I recommend a Medium Size for you. Your right between sizes, I recommend going up in size. I ordered womens small airports brace but the top strapdoed not reach all the way around. If I order the medium ladies is the top staple going to be longer? I recommend exchanging your small for a Medium, the strap will be longer. When the Airsport is applied to your foot. The AirCast Logo should be on your Shin, facing forward. The top strap should be secured on the top of the medial and lateral supports. I recently sprained my ankle and was given the Aircast Airsport ankle brace shown above to wear. I wanted to know what the material is made out of, since I have laytex, spandex, and nylon allergies. The information is not on the tag and I cannot find it on this website. Thank you for all of your assistance. The Airsport has Spandex and Nylon in it. I recommend wearing a sock underneath the brace. Hi I recently suffered a Grade II ankle sprain tearing a ligament and I'm looking for a brace that I could wear to help with recovery but that I might also be able to wear when I return to my sports (flag football, basketball, soccer, ultimate frisbee). Does the Airsport offer the same kind of recovery support as the Air Stirrup? And what is the difference between the A60 and the Airsport when it comes to returning to sporting activities? The Air Stirrup is not recommended to use during activity, it's more of a walking support. A60- has a medial and lateral rigid stirrup, the braces slides on like a sock. The above are all appropriate, your choice is based on your preference. Please call a Product Specialist with additional questions. 1-888-405-3251. Hello, I am a women's size nine but have a very narrow foot. I was wondering if I should order a small to avoid bulkiness? I'm recovering from an ankle sprain. Thanks for your help. The Airsport isn't very wide. But it does have the air cells on the medial and lateral side so you will have to wear an athletic shoe with this brace. It won't fit in a high heel. Depending how much support you need and the activity your returning to, you may be able to select a different brace. Other options I would suggest. Does the Aircast Airsport Ankle brace come in any light colors? The Aircast Airsport Ankle is only available in Black, this ankle brace provides moderate support and compression. We do have a product in White, the Aircast A60 Ankle Support, although this brace provides mild level support. We also have the Kallasy available in white, click on the link below. If you have further questions please call Product Support at 1-888-405-3251. I've bought an Aircast A60 for my right ankle some time ago. Now I've sprained my left one. Is it possible to (maybe only temporarily) wear the right Aircast on my left foot? Any recommendations would be great! If you wear the right brace on the left ankle it will keep you from rolling the inside of your ankle outward but wont protact you from the ankle rolling inward. It would not be advised to wear the brace in this manner, as that is not its intended use..
i just went to the dr's and they gave me this brace aircast airsport brace in a large because my ankle is a little large but it seems bulky i am a size 8 in a sneaker is this right? If you are male you should be in a medium, female a small. The airsport ankle brace is a good supportive brace for those that are active. You may want to look at the DonJoy Ankle Stabilizing Brace. Hello, I just got off a severe ankle sprain but I am well into Therapy and have been cleared to play basketball next week (15 weeks total of recovery). Would you recommend this brace or the Aircast A60? They are confident I don't need to wear a brace but to prevent injury after all this hard work would be a shame. I play basketball with Mid/High top sneakers. I would go with the airsport, it is going to provide more support, which sounds like this is what you need. I would like to order the Aircast Airsport. I have had many grade II ankle sprains on my left leg, and am fully healed now. I usually wear a size 9 sneaker to accommodate my current lace-up brace (and bunions). Would the medium size brace be too bulky, or will it be a snug enough fit? Also, are they made for either foot? I am beginning to do triathlons and need a much speedier brace that I can be comfortable and confident with. Thanks. The Airsport is a great option for the quick and easy application and will definatley help you out during your races. This brace is made right and left specific. And Medium will be a perfect size for your foot and should not be too bulky. How do i clean my airsport ankle brace? Handwash mild detergent, air dry. hi! my daughter's volleyball shoe size is 8.5 but sometimes a size 9 (mizuno shoes). what size should i order for an aircast a60 ankle support that would fit her perfectly? i wanted to get her the aircast airsport but im worried that it might have a bulky feel and that she might feel uncomfortable running jumping or spiking with them so im deciding on the a60 instead, but i need your advise on the perfect fit for her, thanks! If your daughter already had an ankle injury I'd recommend the Aircast Airsport. If she's looking to prevent an injury for the first time then order the Aircast A60. If she truly wears an 81/2 shoe size then order a medium. It's better to have a snug fit in the shoe then have it be too bulky and baggy. I have a 8 yo girl doing serious gymnastics (4 hrs day). We need to find an ankle support she can use during training. Would this be the right model and what would be the right size for my daughter? My son needs protection over both malleolar due to minor fractures of both as well as ankle support for playing sports. Does the AirCast Airsport provide cushioning over the malleolar to protect against impact. Thank you. yes, the Airsport does have some cushioning to for impact as well as semi-rigid shells to give him support while being active. if i am a size 4.5 in mens shoes and a 6 in womens shoes what size should i perchis? How do you wash the aircast air sport brace? You can hand wash in the sink with a mild detergent and then air dry. I have an Aircast Airsport Ankle Brace for a right foot/ankle but now my left ankle is sprained. The right ankle version seems to fit and feel fine on my left ankle. Do I really need the left ankle version? We recommend that you do get the left brace for your left ankle injury. The braces are made specific for right and left feet. The inner semi-rigid shells are formed to fit your ankle bones properly. Wearing them on the incorrect side, could potentially cause more harm than good, being that the shells and shape of the brace will not fit properly. How does one measure the size for the Aircast Airsport Ankle Brace? Is it by ankle or foot size? The Aircast Airsport Ankle Brace is measured by shoe size. We have the brace listed as beign .32 lbs. How fast do most players recover once using this ankle brace?? I've been out on and off for 12 weeks because my ligament i guess hasn't healed right. Only your doctor can advise your recovery duration. How do I wash the Aircast A60 Ankle Support? To wash the Aircast A60 just wash with a mild detergent and air dry. My daughter suffered a level 2 sprain a week ago, it is being treated, wanted an opinion on best ankle brace for a 16 year old female lacrosse player to use to recover from this injury. It is comfortable to wear. Obviously I'm a nurse - on my feet all day with 12 hour shifts. After injuring my tendons the doctor put this on me and when I first saw it I thought I would never be able to work with it on. But the opposite has happened. My ankle actually feels less tired at the end of the day. It hasn't affected my power walking at all. I agree it is a little time consuming to put on and my support sneakers are showing earlier than usual signs of wear and tear but the stability and comfort are well worth it. Love this product. It has rehabbed me through several ankle sprains (very lax ligaments at this point) and now I wear it preventatively. After a serious ankle injury last year, my 3 sport High School Athlete, wears it everyday for practice and games. She has worked through 2 so far in a year (purchasing our 3rd today) as she is very hard on them. However, she finds them very comfortable and supportive playing at an intense level. I've always been prone to sprains; then I needed multiple surgeries on my ankle. I started playing volleyball again and needed a serious brace, so I bought this. I didn't sprain my ankle a single time the entire year. I'm replacing it now after a year of heavy wear and tear. Might be tough to get used to if you've never used this heavy-duty of a brace before, and it might be difficult to get it into your shoe at first. Be careful not to tighten the achilles strap too much or it will pinch and get sore. My old Active Ankles would always give me blisters the few times I wore them, but this brace never did. I've been wearing this brace during gymnastics and it's really comfortable and so far I haven't re-injured my ankle since I've been wearing this brace.